We’ve all made a mixed CD for friends or family because it’s easy to do. 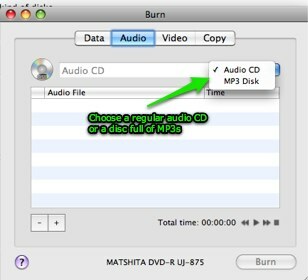 As you get more comfortable using your Mac, though, you may want to start burning different kinds of discs. iPhoto lets you make a backup of your photos, but what if you want to make a Photo CD to pop in your DVD player or send to your family? iMovie, combined with iDVD, lets you shoot home movies with a digital camcorder and turn them into beautiful DVDs, but what do you do if you want to make a DVD out of the 3 videos your daughter emailed to you of the grand kids? And if you want to make a VCD to play in a VCD player? How do you convert image formats such as DMG, ISO, UDF, BIN/CUE, and NRG discs? The expensive answer is to purchase Roxio’s Toast. It will let you do all of this, but you’ll have shell out around $100. There is a free option, and it’s called Burn. It will let you do everything listed above and more. So how can we get started? First, click the link above to download Burn, then let’s open it up. The first two sections, Data & Audio, are probably not what you’re here for, since you can already burn these discs. I’m still going to cover them, so feel free to skip down to the Video and Disk Image sections if you’re more interested in those. You can already burn data discs right in the Mac Desktop, so this portion of the program may not seem as useful. Sometimes, however, you need to burn discs in a particular format. If you want a Mac-only format, you can select HFS+. For a Windows-only format, select Joliet. If you want to use the UDF format for DVDs or the DVD-Video format, those are there, too. Finally, the Mac + PC format is the default one that the Mac OS X Finder uses. VCD is the Video CD format, used on Video CD players and some DVD players. Holds up to 60 minutes of video. SVCD is a higher-quality version of the VCD format (and may be slightly less compatible — make sure your VCD/DVD player can use it). Holds about 45 minutes of video. DVD is the standard format used by DVD players. Holds either 2 or 4 hours of video, depending on whether it is a single or dual-layer disc. DivX is the video equivalent of the MP3 CD: You can store up to 4.3/8.6 GB of DivX files on a DVD to be played back on compatible DVD players. The quality can be similar to DVD or much less, depending on the size of the file. Once you click Yes, another window will pop up asking you where you want to save the converted file (it doesn’t really matter, but I choose the Desktop since I know I’ll throw it away afterward). You also need to select the Region Format: PAL or NTSC. Select NTSC if you live North America, Central America, the Caribbean, or Japan. Some Pacific Ocean island nations use NTSC too. Select PAL if you live anywhere else. 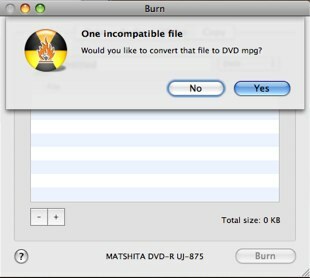 The conversion process will then take place (which can take a few minutes or several hours), followed by your disc being burned. This section is probably not important to new computer users, but for Mac users who exchange many disc images, especially with Windows users, it can be valuable. Nearly all Mac disc images — whether they’re simply the container for an application you downloaded from the internet or a 500 GB image of your entire hard drive — are in Apple’s DMG format. This format is not compatible with Windows. In the Windows world, it is common to use the ISO disk image format. Often the Nero NRG format and the antiquated BIN/CUE images are used as well. Luckily, we can make all of these formats work with the Mac, and we can export the DMG files to Windows users. For this, we’ll use the Copy tab. Note: It is possible to convert DMGs to ISO and vice versa using only Apple’s Disk Utility. 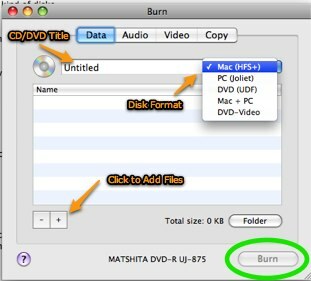 For more information on this, see Lifehacker’s excellent article: How to burn an .iso or .dmg file to disc. If you have a DMG you want to convert for Windows users, press the Open… button in the Copy tab, and select the DMG file. 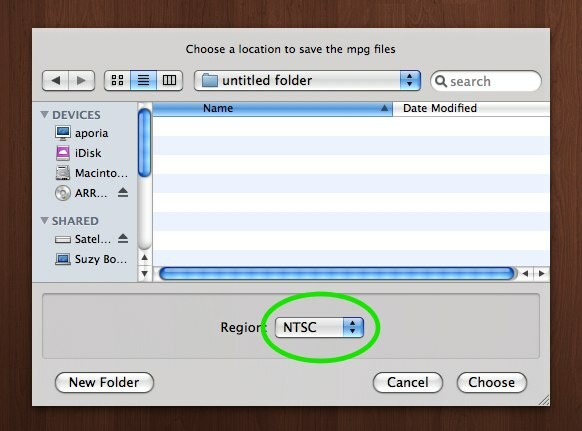 Next, click the Save… button, and choose DVD/CD Master under the Image Format menu. After the conversion process is complete, there is one last step: Your converted file will have the extension .cdr. By simply changing the extension to .iso, you will now have an ISO compatible file to give to Windows and Linux users. This process is even easier. Your Mac should mount ISO files already if you double click them. You can burn them by using the above process of selecting them in the Copy tab, then clicking Burn. Nero NRG files should mount if you change the extension from .nrg to .iso and then double click them. You can burn them by using the above process of selecting them in the Copy tab, then clicking Burn. BIN/CUE files require only slightly more work. You can discard the cue file, as we do not need it. Select the BIN file the same way as we have above, then select Mount if you want the files to appear in the Desktop or select Burn if you want to burn the disc image. Did these steps work for you? Do you have any tips to make the process even easier? Are there are disc formats you’re curious about? If so, post your thoughts in the comments. How is VR Impacting Customer Service in the Future?